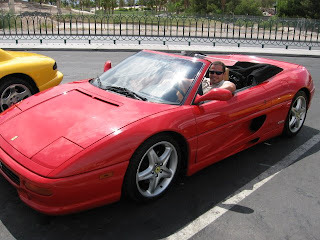 This is a video of a shoulder workout that I did with Vince DelMonte while we were working out at the Las Vegas Athletic Club. We did underhand curl grip shoulder presses, wide grip up right rows, and curl grip front raises. Also be sure to check out Vince's No-Nonsense Muscle Building Program. 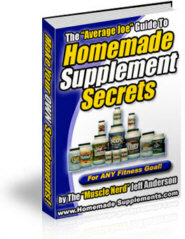 This is one of, if not the, most comprehensive muscle building programs that I've ever seen. If you are looking to be one of the guys who can go to the pool or beach and take your shirt off and turn heads because of the killer shape you are in, then this is the program I'd recommend to help you get there. This is a killer shoulder exercise that my buddy Vince DelMonte showed me while we were working out at the Las Vegas Athletic Club. It’s Power Dumbbell Lateral Raises. It is basically a variation of the standard shoulder lateral raise but it lets you handle about twice as much weight and really overload your shoulders for an awesome muscle pump. Give it a try in your next shoulder workout and then leave me a comment and let me know how you liked it. Click Here to check out Vince's Muscle Building Website. 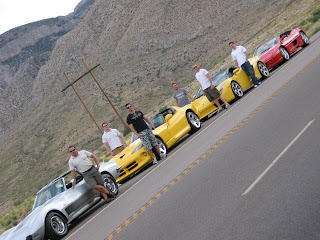 Here's a few pics from Vegas racing a Lamborghini Gallardo, Ferrari 355 Spider, Dodge Viper SRT/10, and a classic old Corvette Sting Ray through Las Vegas and the Nevada mountains. 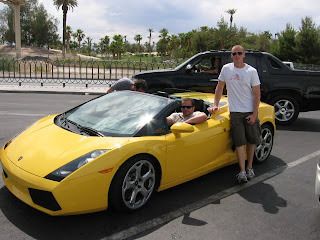 I'm heading to Vegas tomorrow morning and going to be spending a full week there with some fitness guru friends of mine; Vince Delmonte, Joel Marion, Luke Lowrey, Mike Geary, Craig Ballantyne, John Barban, Jeff Siegel… should be a blast and I'm really looking forward to it! Just wanted to give you a heads up that my websites will still be up and running as normal with regards to orders being filled, etc. but if you have any specific questions or things that require my personal attention (i.e. coaching programs, diet plans, etc.) then I'll get back to you with regards to that next week when I'm back home. FREE Muscle Building Program For Skinny Guys Who Can't Gain Weight! "Ok Lee, this sounds too good to be true. What's the catch?" but it works out in your favour. bodyweight for the skinny ectomorph body type. he made it available to the public. the "Hardgainer Project X" a try! shirt busting, muscle growth over the next 6 months. send you a copy of The Bio-Genetic Program. that you don't like the "Hardgainer Project X" system. What could be more fair then that? Either way you slice it, YOU WIN! 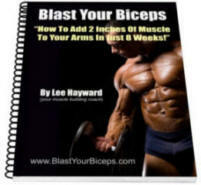 send you a copy of my Bio-Genetic Muscle Weight Gain System! the strong powerful physique that you truly deserve! One of the most common injuries that people will get from working out is a shoulder injury. The shoulders come into play in virtually every single upper body exercise you do, and they also get worked with some lower body exercises as well such as squats where the barbell is held across your back. So if you get a shoulder injury it can really hamper your workouts for the entire body. One of the root causes for shoulder injuries is a muscle imbalance between the front delts and the rear delts. Generally the front delts get much more muscle stimulation and are over developed compared to the rear delts. So to counter this you should include more rear delt work in your training such as the rubber band rear delt flyes. This stuff is taken directly from the "Muscle Nerd"
Jeff Anderson's new hardgainer "ectomorph"
bodybuilding program "Hardgainer Project X"! To Trigger An Explosive Surge Of Thick New Muscle! 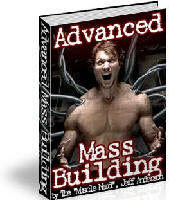 That Targets 373% More Muscle Fibers! DOUBLES Muscle-Protein Uptake For CRAZY New Mass Gains! making it available to the public. to check out these muscle building tips right now. This is a simple yet tasty high protein coffee recipe that you can have before your workouts or anytime to give you a caffeine kick and a shot of high quality whey protein at the same time. Just mix in a scoop of whey protein with your coffee. Mix it up in a large coffee mug so you have room to stir it up. The higher quality protein powder you use, the tastier the drink will be. My personal favorite whey protein is Myofusion Whey Protein by Gaspari Nutrition. This stuff tastes awesome and mixes up nice and creamy for a delicious protein drink or high protein coffee drink. looking to quickly pack on some solid muscular bodyweight! crazy ecto-experiment for his new "Hardgainer Project X". crappy genetics for building muscle mass. strategies that they used to pack on pounds of solid mass. guys who sign up to take part in this new project X.
to see if it's a good fit for you. SERIOUS "hardgainer" (i.e. the ectomorph body type). but this is NOT what you're looking for. building solution you've been searching for! If you want to get a taste right now for how "different"
"The Hardgainer Curse And What To Do About It"
This is one of my favorite tricep exercises that works the entire tricep muscle through a full range of motion. I've noticed that since adding this exercise as a staple to my tricep workouts I’ve gained a lot more size and muscle fullness to my triceps and now the side tricep pose is one of my stronger poses. The main difference with using a decline bench vs. a flat bench is that you get a deeper stretch throughout the triceps in the bottom of the movement. Due to the angle of your upper arms you'll also place less stress on the elbow joint and more stress on the tricep muscles themselves. If you normally do lying tricep extensions on a flat bench then I'd suggest that you give them a try on the decline bench instead. By doing this you’ll work the triceps through a deeper range of motion and help to stimulate more muscle growth. Give them a try and then leave me a comment to let me know how it works for you. The company that I host these live video shows through http://www.ustream.tv has changed their system and now you need to sign up for an account with them in order to participate and ask questions through the chat window. To sign up for your free account just go to http://www.ustream.tv the sign up link is in the top right hand cornor of their home page. Just fill in your details and then you'll be able to participate live on the show! I'm also going to be broadcasting this show over a telephone conference line as well. So if you are having any problems viewing the live video stream you can call in and listen over the phone. The number is 1-218-486-7200 (Bridge # 277155). The pullover is an exercise you seldom see done in the gym anymore. Yet back in the "Pumping Iron" days of bodybuilding it was a staple in almost everyone's routine. In fact, way back in the old days before the invention of bench presses with upright racks for holding the bar, guys would do a barbell pullover, lifting the bar from the floor to their chest, and then do their bench presses. But gradually over the years this exercise got pushed to the wayside and is hardly ever done by the average gym goer. The video clip below shows a couple different pullover variations and how you can use this exercise to add thickness to your rib cage and chest. I have gotten several e-mail from people saying that they read my blog and check out my website from their work place and that youtube videos are banned on their office computers. If that's the case with you than you maybe able to watch the videos at: http://www.metacafe.com/channels/leehayward this is another video site that I have a lot of my videos hosted on and it may not be banned at your work place. One of the fastest ways to gain size and strength in the entire body is by following the 20 rep squat program. This is a simple routine that is as old as dirt, but it works awesome for fast gains, even if you are a hard gainer. There are a several ways to implement this into your workouts. But one variation that you can use to help make all your workouts more effective is to simply add in a set of 20 rep squats before your regular workouts. So for example, if you were going to do a chest workout just get to the gym 10 minutes early, warm up, and then start off with a couple progressively heavier sets of squats. Then take a working weight and bang out a set of 20 rep squats, after which you would just go about your regular chest workout as normal. The reason this works so well is because you are working the big power house muscles of the legs, core, back, as well as numerous stabilizer muscles throughout your entire body. This will stimulate your central nervous system, stimulate the release of more anabolic hormones, and increase your metabolism more than you would with a straight forward bodypart isolation type of workout. If you have been tuning into the Live Total Fitness Bodybuilding Talk Shows lately you know we've been having some technical issues with the video stream locking up. But fortunately I've been making a back up MP3 audio recording of the shows so you are not going to miss any of the killer training and nutrition tips that I share on the show. You can download last Thursday's show by right clicking on the link below and choosing "Save Target As…"